ST. JOHN'S, NEWFOUNDLAND--(Marketwired - Jan. 11, 2018) - Kraken Robotics Inc. (TSX VENTURE:PNG)(OTCQB:KRKNF) announced today that its wholly-owned subsidiary, Kraken Robotic Systems Inc., has completed development of a real-time Synthetic Aperture Sonar ("SAS") system that has been successfully integrated and tested onboard a US Navy REMUS 600 Autonomous Underwater Vehicle (AUV) operated by the Naval Undersea Warfare Center in Rhode Island. "Kraken is proud to have developed an AUV solution for real-time, ultra high-resolution imaging and 3D mapping of the seafloor," said Karl Kenny, Kraken's President and CEO. "We expect this technology will revolutionize the way in which big data from Synthetic Aperture Sonar imagery and bathymetry is processed. We would like to extend our thanks and appreciation to our colleagues at the Naval Undersea Warfare Center for their support in deployment and testing of our solution on their REMUS 600 AUV." Modern mines have become very stealthy. Naval operations designed to overcome this threat depend on a high probability to find the mines and the time required to cover the search area in high tempo. The best method to overcome this challenge is to obtain ultra high-resolution target data at long ranges. High-resolution sonar data improves detection and classification capability by providing more details on the object. 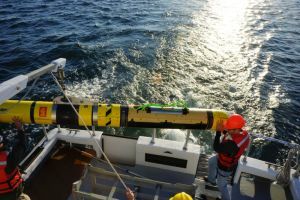 For several years, researchers have been developing machine intelligence that enables autonomous AUV minehunting and the development of automatic target recognition algorithms that increase confidence that a detected object is properly classified. Accurate classification is critical to efficient mine countermeasures. Migrating the algorithms and behaviours to operate onboard the AUV in real-time holds the potential to significantly increase the speed and accuracy for mine countermeasure missions. A major challenge is the acquisition and processing of raw data from sensors to derive actionable intelligence. The key to realize these objectives is the capability to process high resolution sonar data on-board the AUV in real-time to enable the creation of detailed acoustic images. These images can then be analysed on-the-fly by the vehicle's computers to enable the AUV to make enhanced decisions on the best way to continue the mission. At least 5cm of target pixel resolution is required for effective minehunting. This can be achieved with Synthetic Aperture Sonar (SAS) to ranges of over 250 metres. While conventional side scan sonars can also achieve this resolution, they can only do so at very short range, typically limited to less than 25 metres. This range limitation has a direct effect on search times and results in very inefficient area coverage rates. Synthetic Aperture Sonar can provide up to 10 times the range and area coverage rates of conventional side scan sonar. SAS is particularly well suited for AUVs and industry experts predict that SAS will replace conventional side scan sonars for many military applications. SAS technology also has significant potential in other underwater imaging applications including offshore energy, seabed surveying, marine archaeology, debris mapping and search and salvage operations. Mr. Kenny went on to say, "The major concern of mine countermeasures is to keep sailors far away from the mine threat while having a high level of confidence in the detection and classification of possible threats. Real-time SAS signal processing onboard an AUV is a significant step forward from the current approach. Kraken's real-time SAS can increase safety, improve operational efficiency, reduce the mission risk of missing mines and significantly reduce and/or eliminate post mission analysis time." Kraken Robotics Inc. (TSX VENTURE:PNG)(OTCQB:KRKNF) is a marine technology company, founded in 2012, that is dedicated to the production and sale of software-centric sensors and underwater robotic systems. The company is headquartered in St. John's, Newfoundland with offices in Dartmouth, Nova Scotia; Bremen, Germany; and Fairfax, Virginia. For more information, please visit www.krakensonar.com, www.krakenrobotik.de, www.krakenpower.de. Find us on social media on Twitter (@krakenrobotics), Facebook (@krakenroboticsinc), and LinkedIn. About this company Kraken Robotics Inc.